Kit includes 2 Balls of Feza Alp Natural and 1 spool of SWTC String Me Along and pattern. Alp Natural is a novelty yarn that is handspun contains 10% Linen, 10% Silk, 40% Cotton and 40% Viscose. Model color is not available at this time. 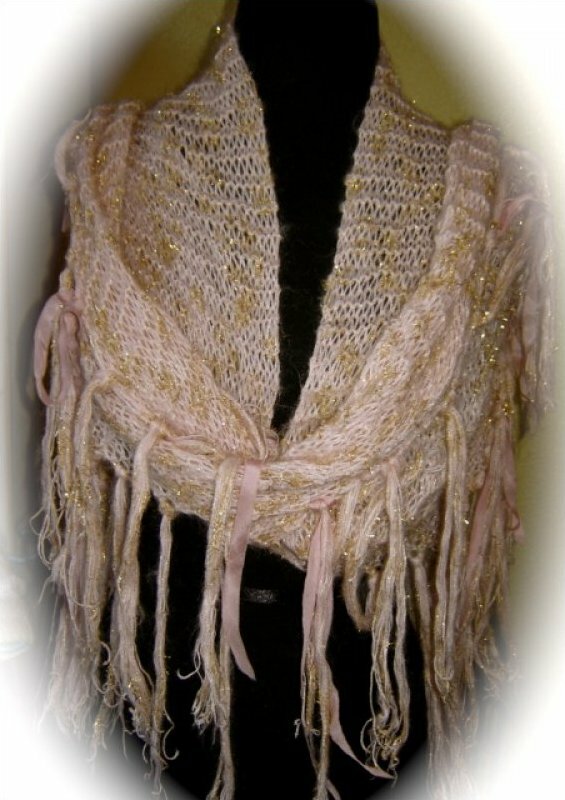 The Aspen Glitter Wrap includes 3 balls of Feza Aspen and 5 strands of Hanah Silk. The sample color is not available at this time. 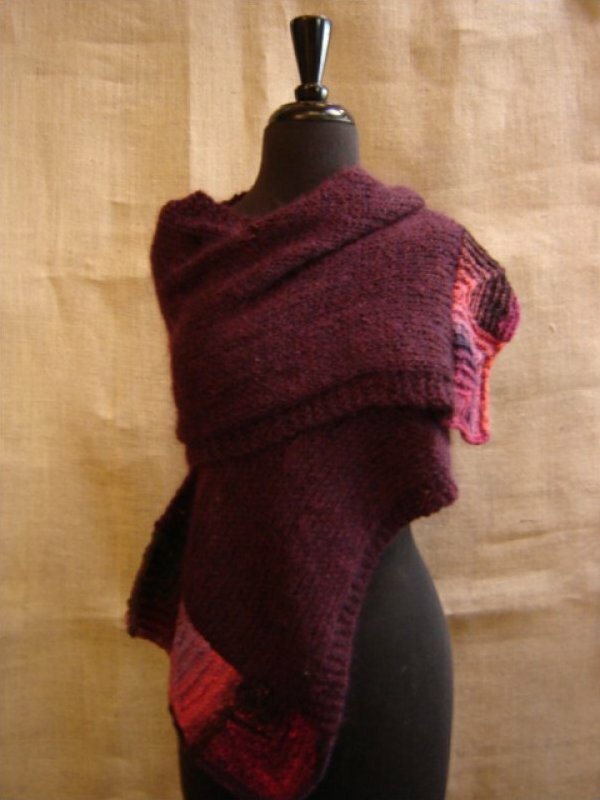 This capelet is knit in a wide rib with Dale of Norway's thick and thin Ara. The borders are edged with bobbles in Louisa Harding's Sari Ribbon, which accentuates their texture. 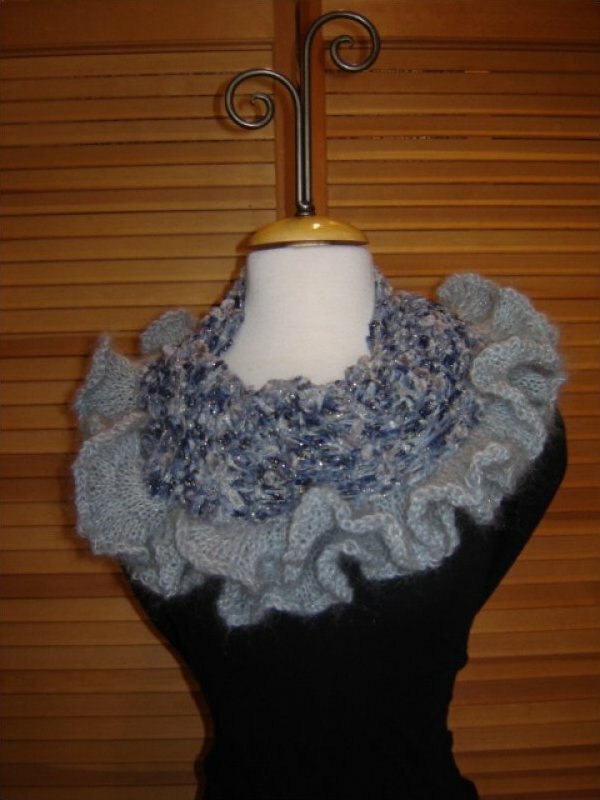 A simple turn row easily adds a chunky collar - very fashionable. 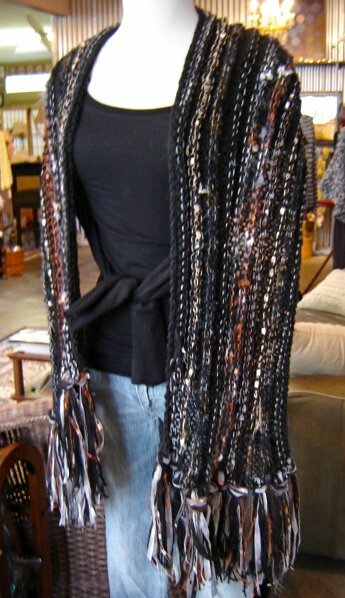 Wrap yourself in elegance with this fashionable wrap. Knit in Blue Sky Alpaca and Feza Mohair, on the ends are mitered squares of Noro Cashmere Island. The sample color is not available at this time. Kit includes 2 hanks Plymouth Baby Alpaca Grande Glow. 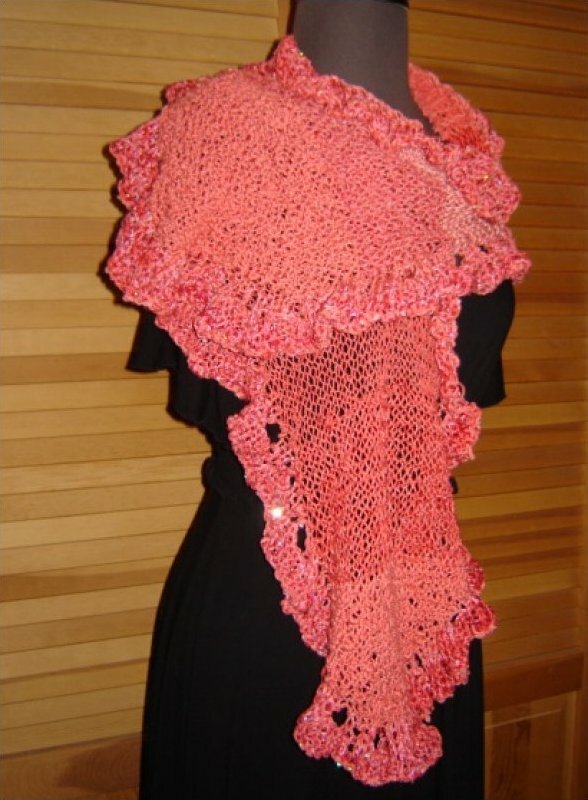 Pattern is free with yarn purchase. For additional Alpaca Grande colors please see the new Yarn category. Colors available are Maroon - 9020 as shown)and Olive Green - 9285. Materials used are M & K Wedding and Grignasco Tikal. PATTERN IS $5.00 Main color in each scarf is Black and Grey. Take a rectangle, add a fabulous flounce of a ruffle and you've got quite the look for the season!! 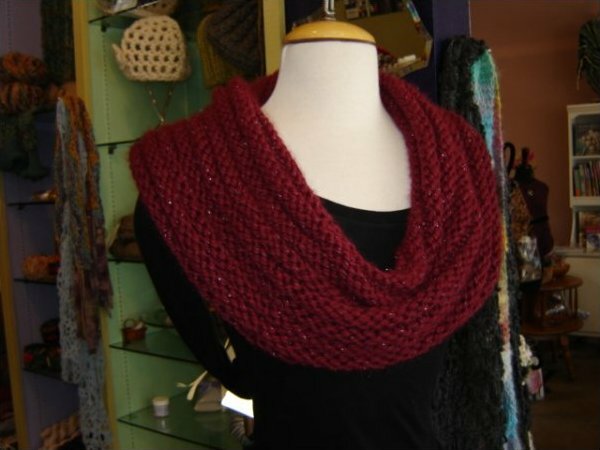 Trendsetter's Pepita is mixed with Habu's Tobi Moire and knit in garter stitch. 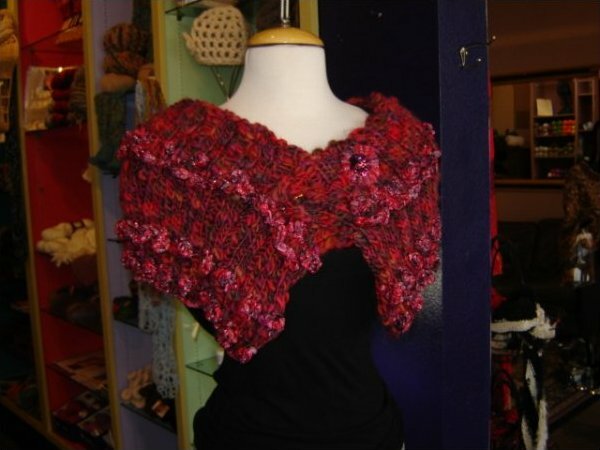 The ruffle is then picked up along the edge with Feza's Kid Mohair or Lama.